Date: 23 June 2014. Some Crabbers are Perverse. As I continue down the west coast of Florida I have come to a conclusion about fishermen. Not all fishermen, mind you. Specifically, I am talking about one particular crab fisherman. The individual I'm dealing with I suspect to be a perverse so-and-so. Today I'm going to tell you why I believe that is an accurate assessment of the situation as it pertains to Seaweed. 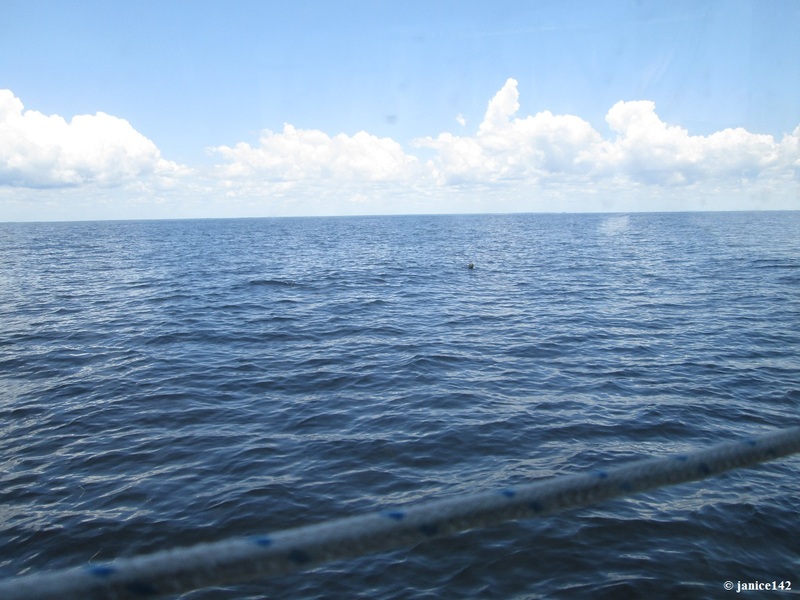 The Big Bend is where Florida turns and heads south. 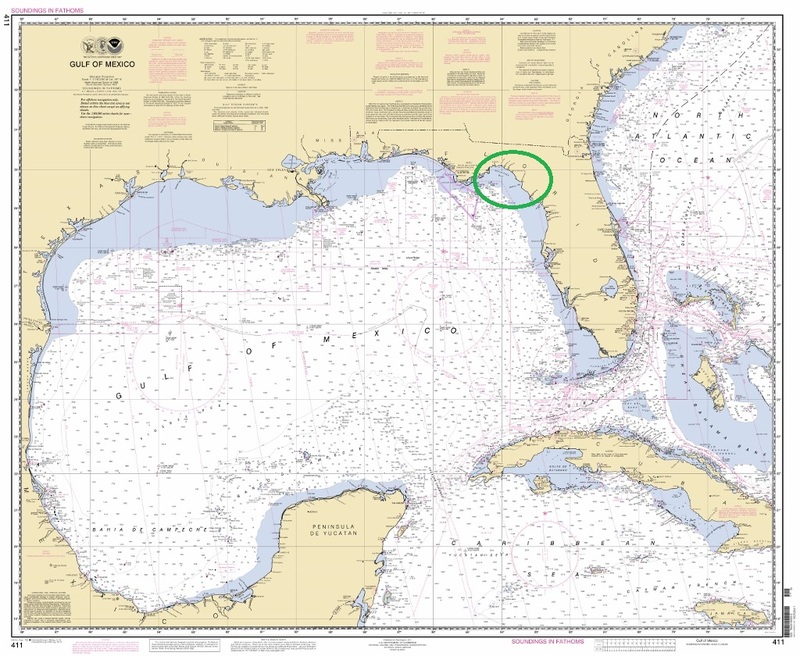 Over here on the Big Bend (see above chart) there are rows and rows of crab pots. They are miles from shore strung out in semi-tidy lines. In order to retrieve said pots, all the crabbers have floats that identify the owner and fishing license for that particular pot. That's all well and good. And some crabbers are fine and dandy, but there are a few perverse souls who create challenges to one's sense of humor. And for the record: I do have a sense of humor. After all, I did get married, and later had Son and Kidlet, plus dogs, cats, iguanas, a Stinky ferret and umpteen ducks. But crabbers? Some are certainly a bit much, even for my sense of humor. Can't see it? Try with binoculars. Look under the cloud that looks like it's pointing to heaven. It's there. 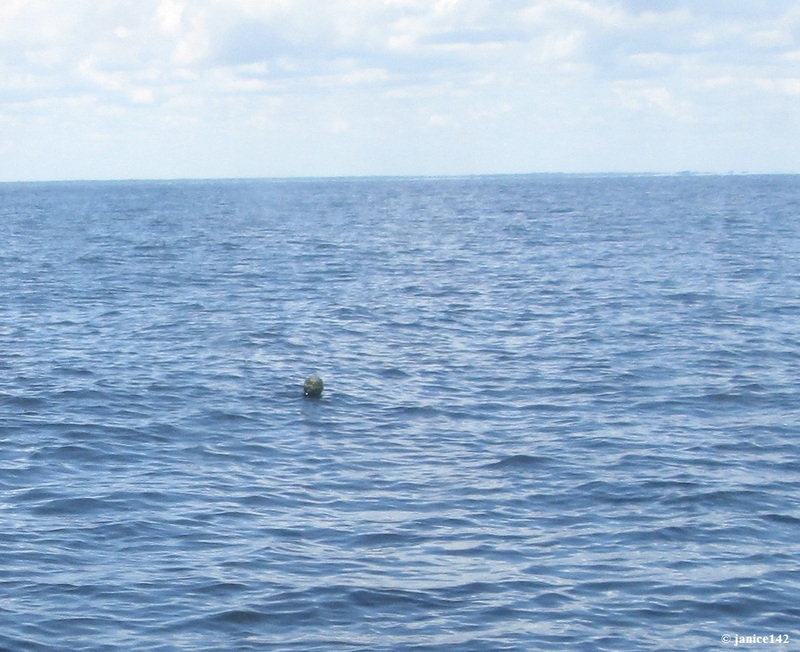 These doggone things are scary when you spot them right in front of the boat. The given method for passing by one that is THISclose, is to immediately put the boat into neutral and coast (drift) past. You see, if the the propeller is spinning the line that goes from the float to the crab pot can become ensnarled. That's a bad thing. Paint the doggone float some other color. Try red, or hot pink or neon anything. But not dark blue-green. It took a perverse sort of individual to think that was a good idea. That's it from the waterfront. Good cruising to you, with all crab pots easily visible too. Happy travels. Have you ever been caught by a crab pot? Do you have line cutters on your shaft, and where do you cruise? Aphorism Alert: The fishermen know that the sea is dangerous and the storm terrible, but they have never found these dangers sufficient reason for remaining ashore. Vincent Van Gogh.